Reno International Airport in Nevada is the closest airport to Lake Tahoe. The airport is a short 45 minute drive to the north shore, and about 1.5 hours to the south shore. 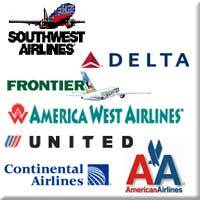 Many different airlines fly to Reno. These are the airlines that fly to Reno International Airport, Nevada and it is your safest, most secure airport in all weather situations. You can book or check your flights in and out of Lake Tahoe, Reno Airport . Continental offers two daily non-stop flights from Houston, TX. Southwest offers many non-stop flights from cities such as Boise, ID; Chicago, IL; Las Vegas, NV; Los Angeles, CA; Oakland, CA; Phoenix, AZ; Portland, OR; Salt Lake City, UT; San Jose, CA; and Seattle, WA. Highway 50 provides direct, all-weather access to the South Shore, and Highway 80 East to Truckee for the North Shore. Car Rental Agencies can help. North Lake Tahoe has a wide variety of shuttles to get you from the Reno Airport to the ski areas, and so does the South Shore. Here is where you can find all the shuttles to Lake Tahoe Resort areas that are available should you not wish to drive.